The parish was in the Bennington sub-district of the Newark Registration District. You can also perform a more selective search for churches in the Foston area or see them printed on a map. The Anglican parish church is dedicated to Saint Peter. The church dates back to Norman times, but the construction date is unreported. The church was here by the 13th century and is believed to be from the 10th century. The north side was rebuilt in 1858. The church is a Grade I listed building by Brisith Heritage. The church seats about 300. A photograph of St. Peter's church is at the Wendy Parkinson English Church Photographs site. The parish registers for burials and baptisms exist from 1626. Marriages were included in Long Bennington's register until 1766. Parish registers are on file at the Society of Genealogists, covering 1646 - 1837. There are a handful of par. reg. entries in our Parish Register Extract. Please submit additional ones to expand it. Boyd's Marriage Index holds marriages from 1651 to 1837, and Pallot's Marriage Index covers 1790 - 1837. The LFHS has published several marriage indexes for the Grantham Deanery to make your search easier. The Wesleyan Methodists had a chapel here prior to 1910. This chapel was eventually taken down and replaced by bungalows and houses. For information and assistance in researching this chapel, see our non-conformist religions page. Foston is both a village and a parish nearly 6 miles northwest of Grantham, lying just south of the River Witham. Long Bennington parish lies to the west, Westborough parish to the north, and Marston parish lies to the east. The parish covers about 2,100 acres. The Foston Beck (stream) completes the eastern border. By automobile, take the A1 trunk road west out of Grantham (toward Newark-on-Trent). The road passes just south of the village. Check out the Foston Village web site for current events. Ask for a calculation of the distance from Foston to another place. You can see the administrative areas in which Foston has been placed at times in the past. Select one to see a link to a map of that particular area. There was a settlement here in Roman times. A Roman villa was excavated here between 1891 and 1896. It is believed that the Saxons settled here, based on both the village name and the artifacts found on nearby Loveden Hill just east of the village. In 1643, during the English Civil War, a battle was fought on Gonerby Moor, between Foston and Marston. The Foston post windmill dated from 1624. Alas, it was demolished in 1966. Check the history of the Wapentake at the Loveden Wapentake website. Foston was part of the manor of Long Bennington from Feudal times. You might enjoy this notice from the 1836 Stamford Mercury contributed by Eric Hollis. In 1871, much of the land in the parish was owned by the Earl of Dysart, J. E. WELBY, but several smaller owners had parcels here. The Earl was still the principal landowner in 1913, but additional smallholders could be found. The Foston War Memorial is a marble plaque in the church. To see it and a list of the names on it, see the Roll of Honour site. The name Foston is from the Old Scandinavian Fos+ton, for "farmstead of Fotr", appearing in the 1086 Domesday Book as Foztun. Here's a list of surnames found in White's 1871 Directory: ALCOCK, ASHER, BAILEY, BARKER, BARRAND, BROWN, BULLIMORE, DICKINSON, DOLBY, EMMONDS, FOSTER, FREEMAN, GUY, HALLAM, HOLLIS, HOYES, HUTCHINSON, JOHNSON, KNIGHT, LINNELL, NEAL, ROBINSON, SPEED, WALTON, WARRINER, WHYLEY, WILKINSON, WILLOWS, WINTER and WRATH. Kelley's 1913 Directory lists these surnames: BIRKETT, BONNER, BULLIMORE, BURGIN, BURTON, DICKINSON, GIBSON, HARDWICK, HARWOOD, HORTON, HOWITT, HUTCHINSON, JONES, KEMM, KENWORTH, KUPER, MARSTON, MUXLOW, PARKER, ROBERTS, ROBINSON, ROWBOTHAM, RYDER, SPEED, WALTON, WILKINSON, WILLEY, WINTER, WOOD and YOUNG. 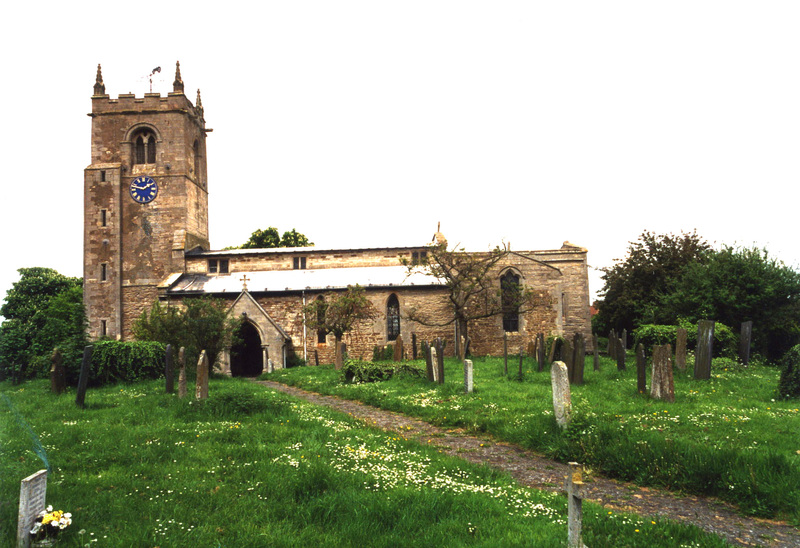 The parish was in the ancient Loveden Wapentake in the South Kesteven division of the county, in the parts of Kesteven. You may contact the Foston Parish Council regarding civic or political issues, but they are NOT staffed to assist you with family history searches. Mary WILDMAN left the interest on £3 for the poor. A Mr. CAWSON left £3 a year from the rent of two cottages for the poor. John GUY established a charity of £100 to provided funds for Foston Church Sunday School. The Common Land was enclosed here in 1796. Bastardy cases would be heard in the Spittlegate (Grantham) petty session hearings. After the Poor Law Amendment Act reforms of 1834, the parish became part of the Newark Poor Law Union. A National School (later a Public Elementary school) was built next to the church in 1847 by subscription to hold 80 children, but attendance was about half that in 1911. The parish school was closed in 1987 and school children were sent to Long Bennington thereafter.